ADDENDUM: I felt the need to bump this blogpost up today. After the latest series of articles here on Copenhagenize about how many traffic safety campaigns blame the victims and place undue responsibility on everybody except the motorists I once again find myself in love with the Dutch. 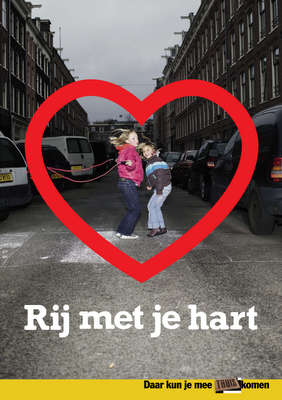 Drive With Your Heart [Rij met je hart] is a government campaign placing focus directly on those who drive cars, highlighting their enormous responsibility in the traffic. 'Cars today are full of things that protect the driver: belts, crumple zones, airbags, ABS, electronic stability control..."
"And there is an element in the car that protects other road users." Note that the woman on the bicycle is actually turning left onto a pedestrian crossing. Correct me if I'm wrong but that is technically illegal. Brilliantly, there is only focus on the motorist. There is light at the end of the tunnel when you realise that there are people out there thinking up campaigns like this and government agencies spending money on them. The car-centric Danish Road Safety Council - and pretty much everyone else - has a lot to learn. Just found another film from the same campaign in 2007. Translation anyone? Isn't it something like "distractions can come from anywhere... Lower your speed." "On the street you may encounter anything, including your neighbour's little girl. Drive with your heart." Dank je wel to Anneke for the link.